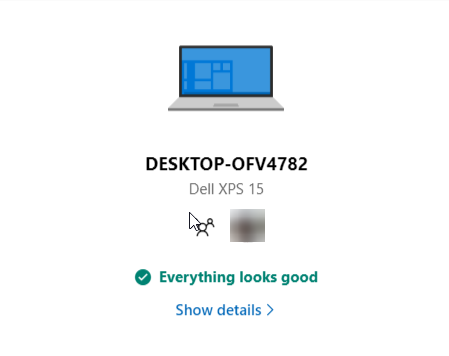 Windows 10 has a neat little feature that lets you not only track your device but also remotely lock it. This feature is very helpful when your device is lost or stolen. 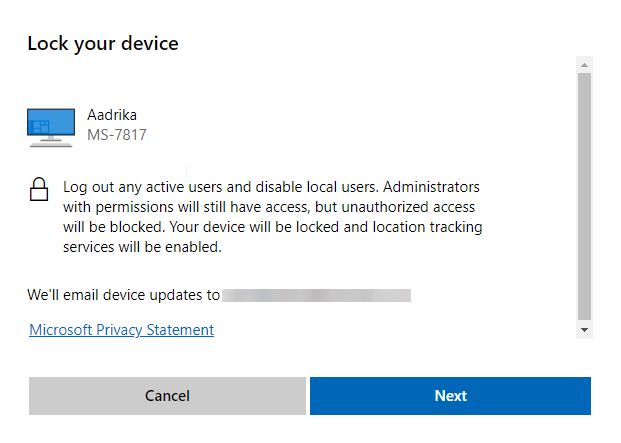 Thankfully, Microsoft makes it quite easy to track and lock a linked device as and when needed. 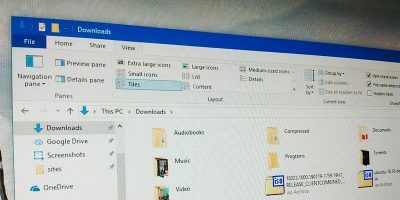 Before you can locate your Windows 10 device, you need to sign into your system with a Microsoft account and then enable the find my device feature. This is the feature that lets you lock your device. If you are using your system as a local user, open the Settings app, go to “Accounts -> Your Info” and click on the “Sign in with a Microsoft account instead.” Now, follow the wizard to complete the account-linking process. After linking your system with a Microsoft account, your device will be listed in the Microsoft Devices page. Once you are done with that, you can now enable the find my device feature. 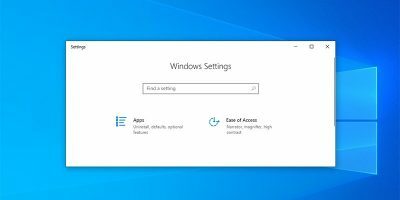 Generally, the find my device feature is automatically enabled if you’ve chosen the default privacy settings while installing or upgrading Windows 10. Otherwise, you need to manually enable the feature. 1. To do that, open the Settings app again and go to “Update and Security -> Find my Device.” On the left pane you will see that “Find my device” is set to “Off.” To modify that, click on the “Change” button. 2. 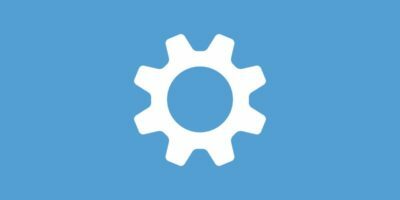 Toggle the switch under “Save my device’s location periodically” to ON. This is how it looks in the Settings app after turning on location tracking. From now on Windows 10 will periodically send your location data to Microsoft so that you can locate your device as and when needed. When Windows 10 is updating the location data, you will see the location tracking icon in the taskbar. 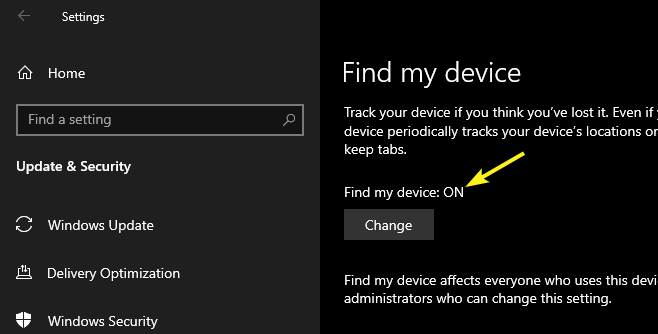 Once you properly set up tracking, you can track your Windows 10 device and lock it directly from the Microsoft devices page. The process is very similar to that of tracking an Android device via your Google account. 1. 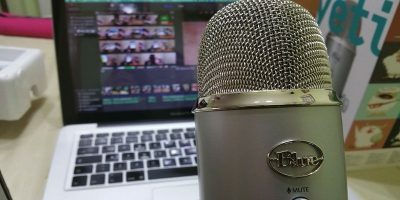 To get started, go to the Microsoft devices page. 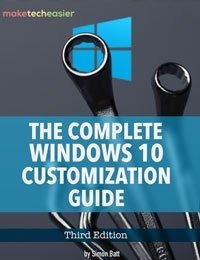 This is the page where Microsoft lists all the devices connected to your account. Find your device and click on the “Show details” link. 2. In the device info page, Microsoft shows a ton of information like the security status of your device, disk space, Windows update status, BitLocker encryption status, etc. Since we want to locate our device, click on the “Find my device” link. 3. As soon as you click on the link, Microsoft will try to get the location data. Windows 10 even shows a notification saying that the administrator is accessing the current device location. If Microsoft cannot get the current location data due to the device not being connected to the Internet or for whatever reason, it will show the last known location. 4. 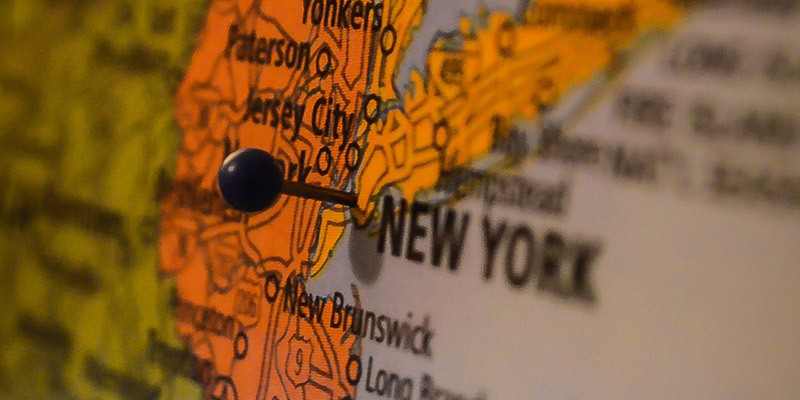 Depending on where your device is and what kind of Internet connectivity it has, the location accuracy will vary. 5. To lock the device, click on the “Lock” button appearing at the top-right corner. 6. In the pop-up window, click on the “Next” button and Microsoft will lock your device. If the device is connected the Internet, it will be locked instantly. If not, it will be locked the next time it connects to the Internet. Once locked, the device can only be unlocked by entering your Microsoft account password. Do keep in mind that when you unlock your device, you will be forced to reset your Microsoft account password. 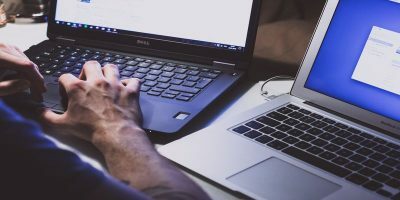 Additionally, if Microsoft identifies any suspicious behavior, it might ask you to verify yourself by sending a link to your alternate email address or a one-time code to your registered mobile number. Of course, this is not a foolproof way, and there are many things that can go wrong while tracking and locking a lost device. Always keep a backup of all your important data. 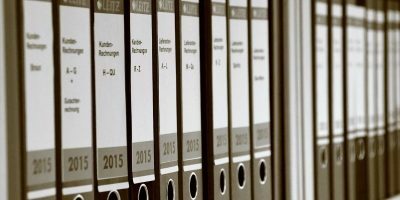 If possible, encrypt important and sensitive files so that they won’t fall into the wrong hands. This is especially important for laptop users who travel a lot. 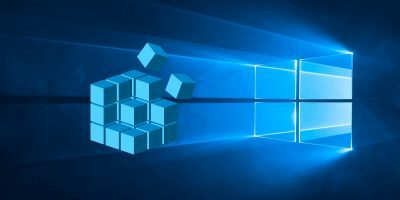 It is that simple to enable find my device and lock lost a Windows 10 computer using your Microsoft account.